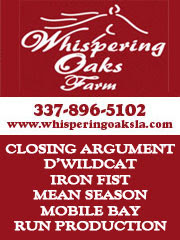 Accredited Louisiana Bred Champions Ballots to mail from LTBA office. LTBA Board of Directors Meeting, Delta Downs, Human Resources Office, 2:00 p.m.
LTBA Scholarship Drawing; two $1,000 scholarships for current college students. Registration between 4:25 p.m. & 5:25 p.m. Drawing in the winners circle after the 5thrace. Must be present to win. Louisiana Derby Preview Day, New Orleans Fair Grounds; G3 Mineshaft H, G2 Risen Star St., G2 Rachel Alexandra S., G3 Fair Grounds H., Colonel Power S., Albert M. Stall Memorial S.
Do you have a date pertaining to Louisiana-breds that you would like included in an upcoming calendar? Please contact Linda 985-386-0360, linda@louisianabred.com or Roger 504-947-4676, roger@louisianabred.com for consideration.